iPhones are generally used for personal calls, while the Bria is used not just for business calls but as an extension of your business phone. The call-handling mechanisms, such as presence, transfer, and HD voice, surpass the basic functions of the iPhone. The cost incurred by calls made to and from Bria are associated with your business phone system, so you can avoid racking up your own personal phone bill when you're away from the office. We'll conduct this review assuming that you have an interest in working remotely, since this is presumably Bria's primary audience. That said, you don't have to work away from the office to use Bria. Some people simply prefer softphones to deskphones. The Bria iPhone Edition interface is immediately familiar to anyone who's seen Bria before. Its design has become, in many respects, iconic in the softphone space. The signature sleek black and yellow coloring is consistent with its PC apps and its other mobile platform apps. The controls and navigation fit the iOS design scheme nicely. If you know how to use an iPhone, you can use Bria's intuitive controls with ease. From the main menu, you can browse through your phone’s existing contacts. 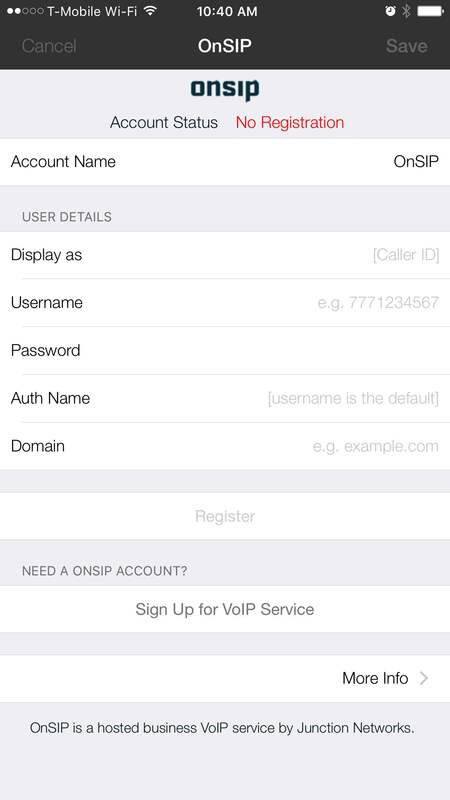 You can also use a shared external account, such as your Google account, to place a VoIP call. If you purchase the presence and messaging features, you can monitor the status of contacts and message them directly. These features require an XMPP domain to work. There was never any lagging when we selected various keys in the app. The various account options and preferences allow for a fairly granular level of customization in an effort to operate seamlessly with your provider. Overall, we didn't find much added to the outward design features. However, considering that Bria already has an excellent presentation, this was not an issue. 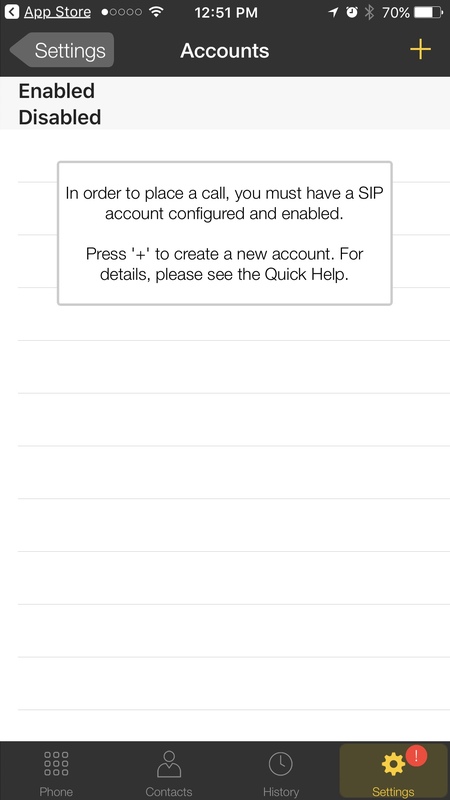 At first glance, Bria iPhone Edition puts most desk phones to shame, with the ability to register up to 25 SIP accounts. The phones we review typically support four to eight SIP accounts at best. 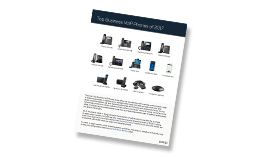 Bria's business phone features are comprehensive, supporting functions such as call recording and a plethora of multiple call support options. These are the solid features that would anchor any desk phone. In our daily usage of Bria iPhone Edition, we could transfer calls, place calls on hold, and initiate three-way conferences with ease. Most of the quibbles we had were with iOS implementation, not with Bria itself. For example, we found that Bria would capitalize the first letter of an entry when it you tried to add a user name in the Buddies section. In the big picture, this is a very minor issue. Some of these features cost more than the app itself. Arguably one of the most important features, presence and messaging, should have been included with the original app purchase. The sound and video quality for Bria iPhone Edition are fantastic. In a WiFi environment, the G.722 codec is crisp and clear, sounding about as good as a SIP call can hope to on an iPhone. If you're working remotely, we found that it was easier to switch the voice codec to GSM or G.711a/u. Bria can use different codecs for WiFi or cellular networks, depending what connection you're using. Video calling is available, but the function is acquired via an in-app purchase. Over WiFi, we found the video quality to be excellent. The experience was comparable to Apple’s FaceTime app. A cellular network, on the other hand, can cause lagging issues for the video. At times, bad connectivity led to freezes, glitches and stutters in the video. Call must be transferred correctly to C. B must be released correctly after the transfer. When C picks up, audio must work in both ways between test phone and C. When test phone is on hold, there is no audio between it and phone B. Since Bria iPhone Edition is made by Counterpath, the interoperability is as rock solid as you would expect. The phone succeeded in all of our SIP tests. Transfers did not drop, we could place calls on hold for minutes at a time without issue, and we found no interoperability issues with various OnSIP apps. Step 2: Download Bria from the App Store. On your iPhone, go to the App Store and search for "Bria iPhone Edition" to purchase the app. Step 3: Configure OnSIP Hosted PBX user account information. When you start Bria iPhone Edition for the very first time, it should automatically take you to the "Account" screen. If for some reason that is not what you see, you can get there by clicking "Settings" from the bottom navigation bar and selecting "Accounts." Note that you can enter information for multiple accounts. If this is your first SIP account, click the “+” sign in the upper right-hand corner to create a new account. 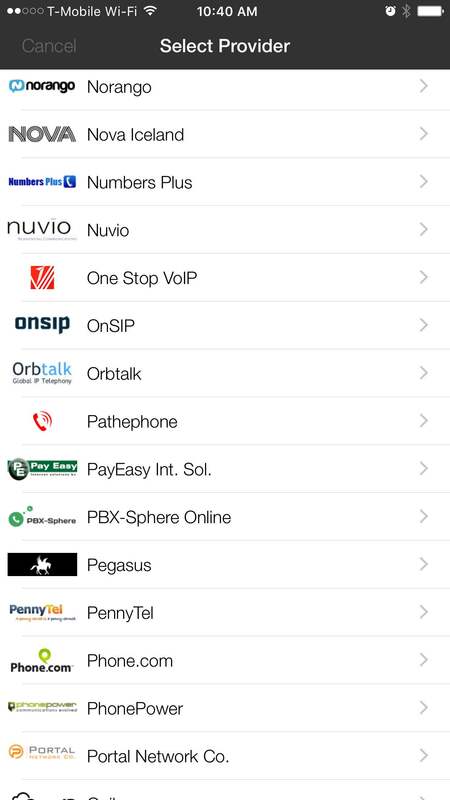 Once selected, you will see a screen with a list of VoIP providers. Select "OnSIP" to continue. After you have filled out the fields, click the "Register" button at the bottom of this page to complete the setup process. If you need a mobile extension for your desk phone, then Counterpath’s Bria iPhone Edition is the softphone for you. Bria is a very powerful, well-designed app that houses all the best features of a business phone under one roof. With multiple codec support, video calling, presence, messaging, and HD voice and video, Bria is a powerhouse softphone that packs all that versatility into a single app on your iPhone. At $7.99, Bria is well worth the price. Our only criticism has nothing to do with the phone or features but with the way that it's priced. Having to pay for crucial features with in-app purchases is far from ideal, but at the very least, it ensures that users aren't getting charged for features they don't want. Still, it would be nice to see an all-inclusive Bria package at some point. Bria for iPhone gets our highest rating: 5/5 stars.